Anything chai-spiced gets us going here at Aura Chai… but I am particularly excited to post this recipe!! I am gluten-intolerant, I avoid sugar, and I’m transitioning from veggie to vegan. Although things are getting better it’s still hard to come by tasty treats when I’m out and about. 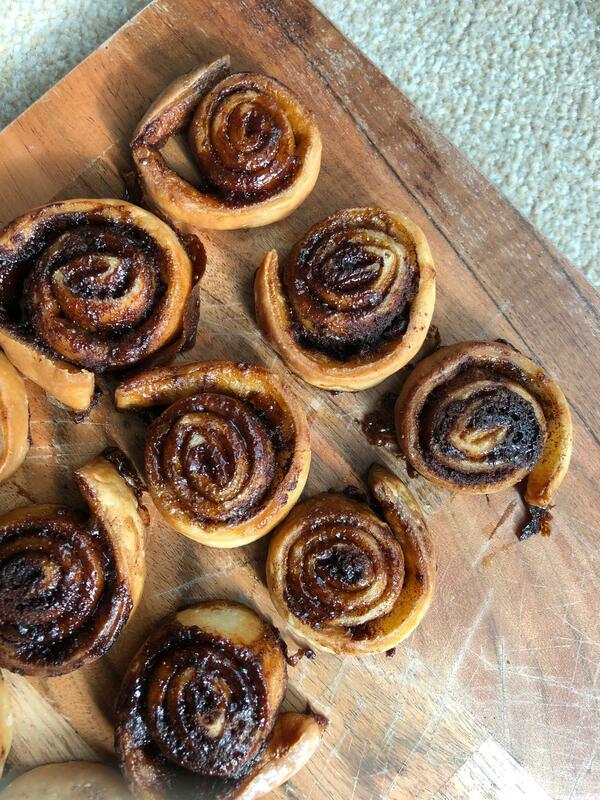 This cinnamon rolls recipe ticks allll the boxes. It’s free from gluten, animal products and refined sugar. And it’s super easy. I made these on a Saturday morning saturated with work to do and life admin to be ticked off (three words: Ikea Bed Build). 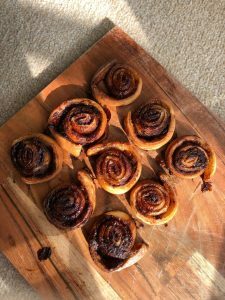 So if you like cinnamon rolls (or cinnamon buns – whatever you fancy) – and you like chai, you’ll LOVE this. I adapted a traditional recipe and added a few chai spices to make it really pop. 1/ Heat the oven to around 180c. Take the pastry out of the fridge and let it warm up to room temperature. 2/ Roll the pastry (if applicable) or just lay it out on a nice big wooden board. Brush over the melted ‘butter’ until the whole surface is covered. 3/ Sprinkle over the sugar evenly. Then follow with a liberal amount of cinnamon to coat the pastry twice. 4/ Sprinkle on a little nutmeg and a little cardamom. Be less liberal than you were with the cinnamon here! 5/ Carefully roll your pastry from the shortest side into a big long sausage. 6/ Use a super-sharp knife to slice inch-thick rolls from the sausage. Lay them on a buttered tray and pop them in the oven for around 20 minutes, until golden brown. 7/ Try not to eat a whole batch of cinnamon rolls in one go!! Next post: What are the health benefits of green cardamom?